(Nanowerk News) A chemist from RUDN was the first to use catalysts with ruthenium nanoparticles to obtain hydrogen under the influence of visible light and UV radiation. 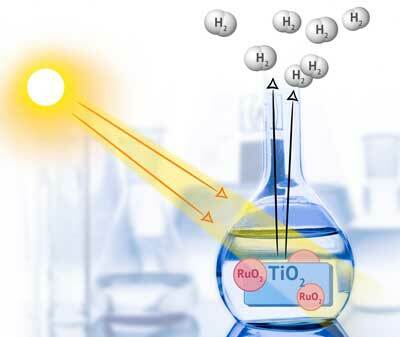 In the future, such catalysts may be used for large-scale production of hydrogen fuel under the influence of sunlight. The results of the study were published in Applied Catalysis B: Environmental ("Enhancing photocatalytic performance of TiO2 in H2 evolution via Ru co-catalyst deposition"). Photochemical reactions are one of the most eco-friendly ways of producing "green fuel". They don't consume a lot of energy for heating the raw materials or supporting high pressure levels. To maintain the speed of the reaction one needs only light and photocatalysts. Photocatalysts based on platinum, gold, and palladium are highly efficient in such photochemical reactions as hydrogen extraction from biomass derivatives, such as alcohols. However, these metals are expensive, therefore the scientists are in search of cheaper photocatalysts. Together with their Spanish colleagues, RUDN chemists studied the photocatalytic activity of titanium dioxide enriched with ruthenium particles. It was the first time they were used to obtain hydrogen. The chemists monitored the influence of a titanium-dioxide based ruthenium nanocatalyst on the emission of hydrogen from a methanol-water mixture. The team studied four catalysts (with 1%, 2%, 3%, and 5% ruthenium content), and each of them was tested in two types of reactions - in the presence of visible light and UV radiation. Before that the systems of titanium dioxide and ruthenium were rarely used, therefore it was important to characterize their composition and optical properties, including quantum efficiency. It indicates the photosensitivity of a material and is calculated as a ratio of the total number of photons causing the formation of free electrons in a materials and the total number of absorbed photons. This is the main parameter used to compare the photocatalytic activity of substances. Experiments have shown that the activity of ruthenium-containing photocatalysts under UV radiation is comparable to platinum and palladium analogs. The quantum efficiency of platinum or palladium based compounds calculated on the basis of other studies makes up from 1.9% to 5.1%, and the results of ruthenium photocatalysts stay within this range. The best value (3.1%) was calculated for the system with 3% ruthenium content. Taking into account the cheapness of ruthenium catalysts, it makes them promising for industrial use. The activity of ruthenium catalysts under visible light was quite low -the quantum efficiency did not exceed 0.6%, but the authors expect it to increase under sunlight up to 1.1%. The scientists have already started verifying this hypothesis.